“Melancholia: A Sebald Variation” takes the viewer on a Sebaldian journey from the ruins of 1945 to the present day. It begins at that ‘zero hour’ after the war when melancholy found its physical form in the rubble scattered throughout its cities after the Second World War and its human form in the refugees who wandered around them. Tracing its way from the ruins of Britain and Germany to the suburbs of contemporary Holland, the exhibition aims to provoke reflection about the European condition and about the nature of melancholy itself. Is it, as in Freud’s formulation, an indulgent, unproductive form of mourning? Or can it be, as for Sebald, a form of sadness that is ultimately uplifting because it enables loss to bring with it a consciousness of life and its more startling possibilities? Alongside Dürer’s Melencolia I this exhibition will display works from a wide range of international artists, including Dexter Dalwood, Tacita Dean, Susan Hiller, Tess Jaray, Anselm Kiefer, George Shaw, Guido van der Werve, and Jeremy Wood, as well as archival materials and a film of Sebald in discussion with Susan Sontag. This exhibition has been done in collaboration with the Centre for Contemporary Culture in Barcelona (CCCB) which presented some of these works in their 2015 exhibition “Sebald Variations” curated by Jorge Carrión and Pablo Helguera, which I wrote about at the time. *For more on van der Werve’s 54 minute video, click here or watch a brief clip of it here. A CD of the requiem he composed for the work can be purchased here. More than fifteen years after his death, the writings of W.G. Sebald continue to inspire artists and exhibitions. The latest example is an announcement by the PayneShurvell gallery, whose next exhibition will be “The Arca Project: An Exhibition Inspired by the Work of W.G.Sebald.” According to their website, “The Arca Project is an exhibition consisting of 16 visual and 16 textual responses to one single image. Each response has been realised as a limited edition print, developed and made by Invisible Print Studio.” The exhibition is scheduled to open April 1 at a location about a half hour north of Ipswich in Suffolk, England (details at their website). In Heike Polster’s book The Aesthetics of Passage: The Imag(in)ed Experience of Time in Thomas Lehr, W.G. Sebald, and Peter Handke, which I wrote about recently, Polster reproduces a painting that I had never seen before by Sebald’s close friend Jan Peter Tripp, which he created in 2003 as a memorial portrait of Sebald. Titled “L’Oeil oder die weisse Zeit” (“The Eye or the White Time”) the acrylic on canvas painting is divided into five sections, four of which represent Sebald seen from different angles. 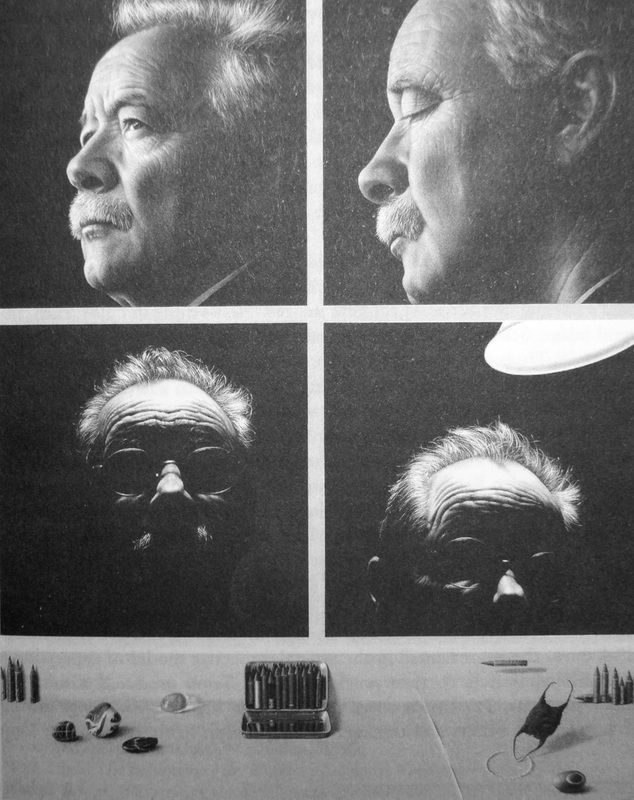 Looked at sequentially, the four portraits depict Sebald gradually disappearing and a bright light coming into view over his head, while the bottom section represents a mysterious still life comprised of pencil stubs and other objects, some of which appear to be small, polished stones. 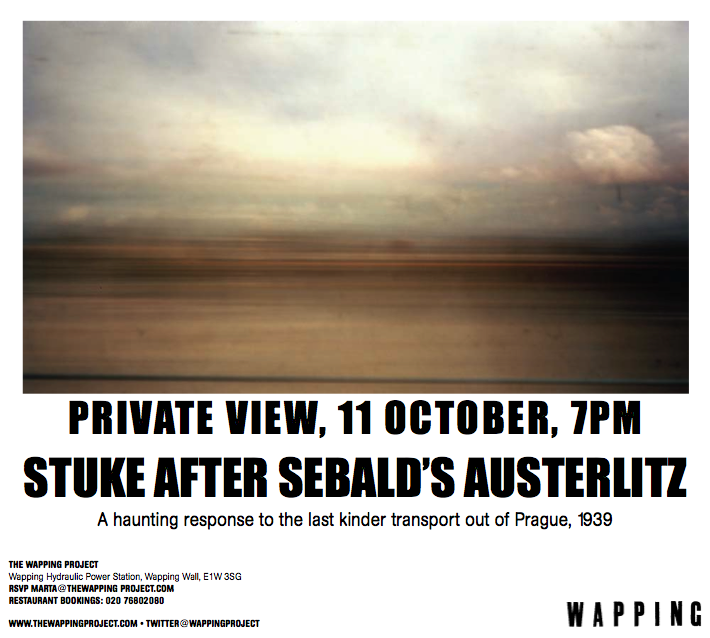 According to Polster, the painting was made on the second anniversary of Sebald’s death and is currently owned by Sebald’s widow, Ute Sebald. The reproduction below is more or less how the painting appears in Polster’s book. The exhibition shows works by the following artists: Carlos Amorales, Mariana Castillo Deball, Simon Faithfull, Andrea Geyer, Pablo Helguera, Núria Güell, Susan Hiller, Josiah McElheny, Trevor Paglen, Fernando Sánchez Castillo, Taryn Simon, Jan Peter Tripp, Guido Van der Werve, Jeremy Wood. 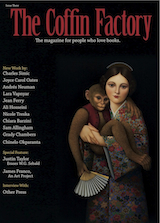 It will also include contributions from the following writers: Piedad Bonnett, Jorge Carrión, Julià de Jòdar, Reinaldo Laddaga, Valeria Luiselli. The exhibition “Sebald Variations” seeks to introduce a critical reflection, and recount the different ways his work has influenced and engaged in a dialogue with the visual arts and literature since his passing in 2001. The exhibition examines the way several conceptual strategies for using images with texts, for historical reflection, for the unexpected juxtaposition of scenes and narrativity as a whole, not only appear in Sebald’s work, but have, on countless occasions, been directly or indirectly alluded to and even included in the works of a number of artists. The exhibition takes into account the different exhibitions, publications and artworks associated with Sebald that have been produced since 2001, or which enter into a dialogue with his books, in order to look at his ongoing impact on the artistic endeavours of today from a new perspective. The project has been conceived as a visual and textual essay that brings together the voice of the author and other creators working in different fields. It pursues Sebald, comments on him, prolongs him and draws him out of himself in order to create new proposals in his company. 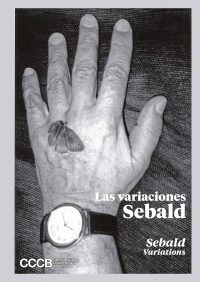 The CCCB presents The Sebald Variations, in which the German writer of some of the fundamental texts of our turn of the century such as The Rings of Saturn and Austerlitz forms the leading thread in an examination of the history of the 20th century and its projections into our present. How useful are Sebald’s books to understanding 21st-century culture? How can we escape from the “pedagogical prison of memory” that anchors us in the horrors of the 20th century without blazing the trails of a social construction of the future? At K15, we embark on a series of conversations with writers, essayists and artists set on exploring the core themes of the exhibition, creating synergies by joining the spirit of the festival with the author’s unorthodox approach. The Kosmopolis website also offers the Sebaldiana blog, an online space to explore Sebald’s world. 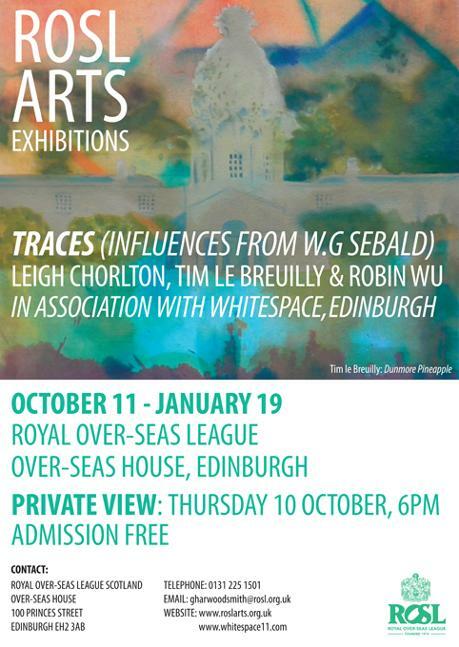 Traces is an exhibition by artists Leigh Chorlton, Tim Le Breuilly, and Robin Wu, who have put together work influenced by the writings of W.G. Sebald. 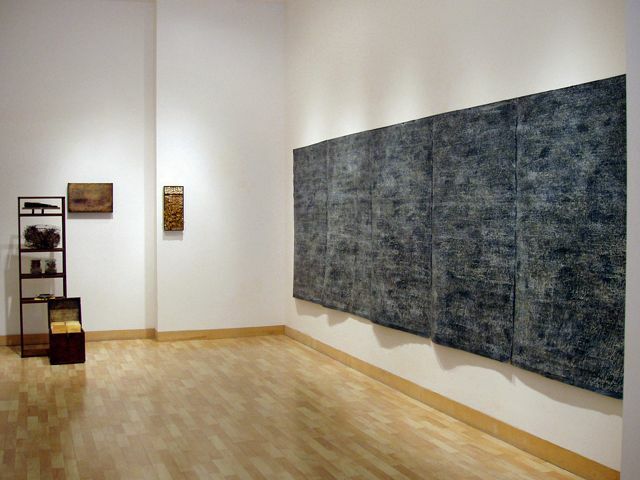 Each have their own personal interpretation and influences from his writing, which in turn is imbued in their drawing, painting, and printmaking. 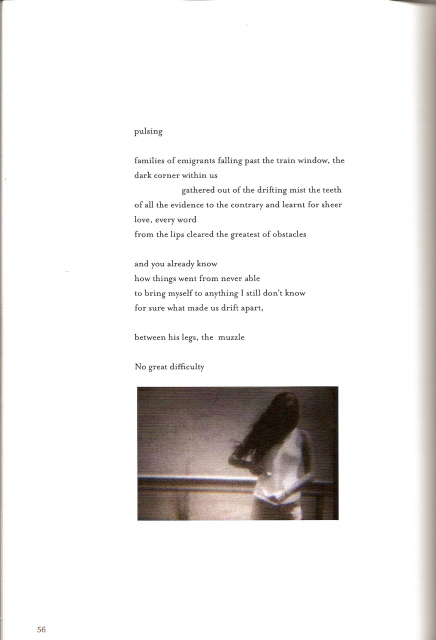 Erasure is a method of delving into the depths of a text to see what can be found there. But the eraser is liberated—as well as made anxious—by the knowledge that said findings are not discoveries but creations. The erasure-text is not a salvage: it has no reality independent of the search for it, the searching is in fact what made it real. 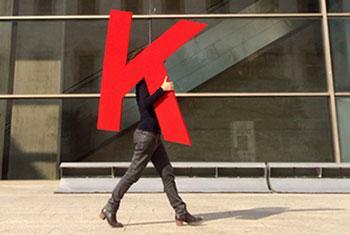 Erasure, therefore, is a way of being read, at least as much as it is a way of reading. 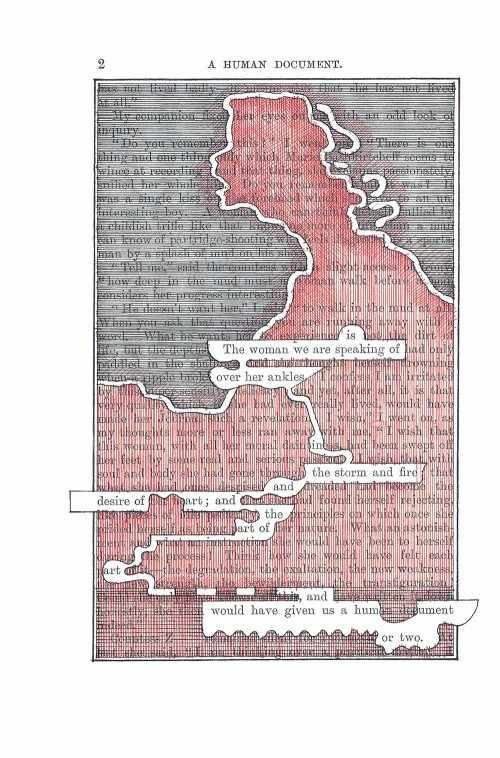 There is a small universe of erasure-based poetry, but probably the most well-known example is A Humument, in which Tom Phillips made an entirely new, illustrated novel by eliminating parts of the text of an obscure Victorian book. Phillips painted on and decorated the original pages of the book as a way of editing out much of the original text, saying that he “plundered, mined, and undermined its text to make it yield the ghosts of other possible stories, scenes, poems.” Taylor’s strategy is very similar, although he’s only using (and retyping) Sebald’s altered text rather than playing with the physical pages of Sebald’s book. Taylor explains that he asked Hayward “to punctuate my erasure-text with images that would simultaneously pay homage to Sebald at the level of form while undermining or re-imagining them at the level of content.” Unlike Sebald’s snapshots and found photographs, Hayward’s are described as “intentional artworks.” They also deliberately relocate” The Emigrants to the US, where both Taylor and Hayward live. Based on the three photographs in this excerpt, it’s seems fair to say that Hayward has created a parallel imagery that references Sebald’s photographs in several ways. Reminiscent of the many sources for Sebald’s imagery, the three photographs here are done in three distinct styles: a sharply-focused sepia image of a 1940s car on a road in the American West; a dark, over-exposed black-and-white image of a small boy dressed in Western clothing (almost an ironic twist on the cover photograph from Austerlitz); and a slightly blurred image of a young woman making an enigmatic gesture or movement, as if cleaning something from her blouse. Here are further details on the previously announced Festival Robert Walser being held in Newcastle upon Tyne, March 19-23. I think the key information is this: All events FREE. 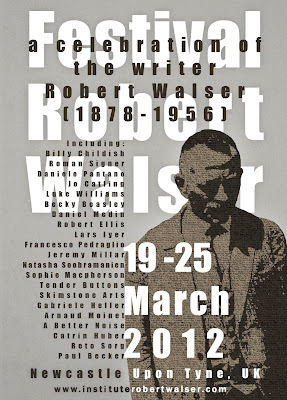 For more information on all events go to the Robert Walser Institute website. A radio discussion on the role of madness in art and artistic legacy. Newcastle University students show filmic work in response to Robert Walserʼs Microscripts. A talk by Reto Sorg about Robert Frankʼs exhibition Ferne Nähe /Distant Closeness at the Robert Walser Zentrum, Bern March 2012. A theatre performance by Gabriele Heller (theatre-between) and Claire Webster-Saaremets (Skimstone Arts). Followed by a musical piece by Phil Begg and a musical performance by Joe Murray. 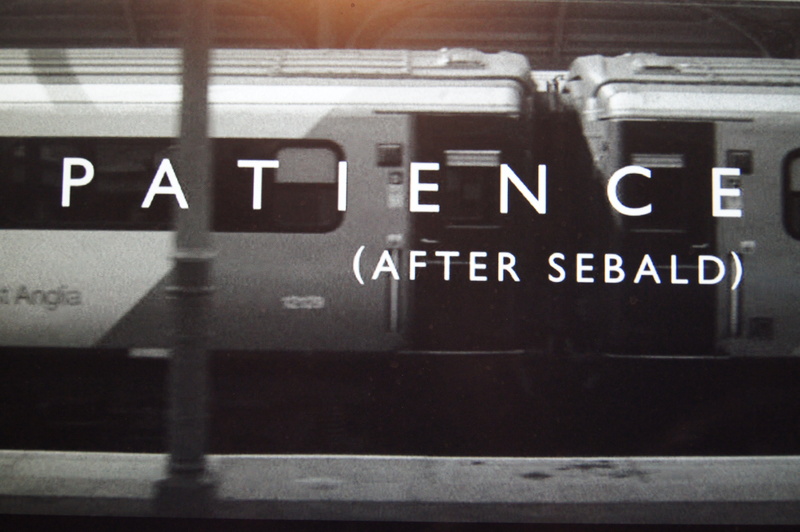 Finally, on another note entirely, Grant Gee’s film Patience (After Sebald) will be shown at the San Francisco International Film Festival, April 19-May 3.